PJ Harvey has this morning unveiled the video for her stunning new single 'The Glorious Land' (out on 18th April via Island Records) on YouTube. Check it out below. "As with the other films, I wanted to avoid too literal an interpretation of Polly's lyrics, but to try to remain true to the spirit and feel of the track. 'The Glorious Land' was the third film we edited and completed in Berlin in the cycle of the 12 films, the first was 'The Words That Maketh Murder' and the second was 'The Last Living Rose'. Both editor, Sebastian, and I loved this track, and for me the bugle blast and where it sits is truly a glorious thing. It has the courage to be discordant, out of place and yet perfect on its own terms, surely the quality of great Art? At the first London show at the Troxy last week, when the bugle came in as they played 'The Glorious Land' it was like experiencing the music floating high above the band and audience and hovering over all of us like a massive Jackson Pollack. And it swung. "I had noticed interesting things coming through the trees when driving around Dorset in October. Autumn colours, the sunlight streaming through the trees, the effect of movement during driving, how things changed if I speeded up or slowed down. How the angle at which the camera was held changed things so I started experimenting with shooting and driving. Some of this was shot through the car sunroof straight up into the sky, some deliberately overexposed and out of focus, to increase the abstraction. I particularly liked the white, washed-out look of the sky and how at times there are stretches of pure white. I originally had 'All And Everyone' in my head for these images, but knew visually it could work elsewhere. But when we started editing 'The Glorious Land' it became obvious it was made for it." PJ Harvey’s eighth studio album was recently released to widespread international acclaim and ‘Let England Shake’ has garnered Top 10 chart positions in the UK, Australia, Denmark, France, Finland, Greece, Ireland, Portugal, Sweden, and Switzerland and debuted at number 2 in Belgium & Norway. 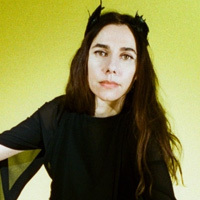 Having completed a sold out European tour, including two triumphant dates at the Troxy in East London, PJ Harvey will return to London this summer with a performance at Alexandra Palace on July 23rd. Harvey will also play this year’s Coachella Festival sharing the bill with Kanye West and The Strokes on April 17th. Mercury Prize Winner, PJ Harvey was awarded the Teenage Cancer Trust Outstanding Contribution to Music at this year’s NME Awards, performing at last month’s ceremony with live band Mick Harvey, Jean Marc Butty and John Parish. PJ Harvey can turn her hand to anything. 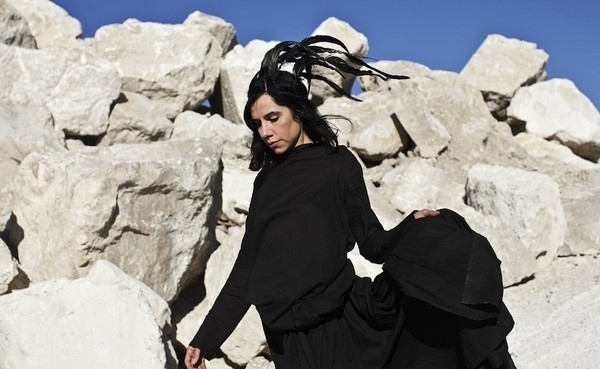 Photo: Seamus Murphy​ PJ Harvey and British composer Harry Escott have shared a video for An Acre of Land. Photo: Seamus Murphy​ PJ Harvey and British composer Harry Escott have collaborated on the theme for the upcoming Dark River film.